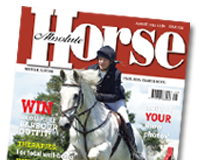 Would you like to know more about producing and presenting top show horses? Are you interested in a behind the scenes tour of a top veterinary practice? If the answer is yes, then head to the Paton & Lee Equine Veterinary Surgery presentation, on Saturday 19th October in Rivenhall, Witham, Essex. Leading show producer and international judge, Katie Jerram, will be kicking off the event at 10.00am with a presentation on the production and preparation of show horses and what judges are looking for in competitions. Katie, who produces and rides for Her Majesty The Queen, will be bringing along some of her top horses (subject to availability) including Barbers Shop, Champion at Hickstead this year and the multiple Supreme Champion, Dunbeacon. The presentation will take place outside, so please dress according to the weather conditions. The presentation is being supported by one of Katie’s sponsors – Equitop Myoplast – a scientifically designed amino acid supplement which Katie uses in her horses to help with muscle development when producing them for the show ring. After her talk, Katie will be signing copies of her new book – Katie Jerram on Showing – which is a must for not only showing enthusiasts, but also anyone wanting to build a solid partnership with a horse and improve its going. The book costs £25, so don’t forget to bring some money with you. Tours of the practice will be available on the day and Equitop Myoplast representatives, along with veterinary surgeons, will also be on hand to talk to horse owners about this natural muscle supplement, which is scientifically designed to support efficient muscle development. For further information on the Paton & Lee open day, please contact 01376 513369. For details on Katie Jerram visit www.katiejerram.co.uk and Equitop Myoplast visit www.equitop-myoplast.co.uk. Bridleway experts say that plans to tarmac a route in Suffolk to make it more accessible for cyclists will put riders at risk and could have wide repercussions. Suffolk County Council has announced a scheme to tarmac a two and a half mile bridleway from West Row village to Mildenhall. The announcement came as a surprise to riders and neither they nor the British Horse Society was consulted. Riders, who plan an awareness ride along the bridleway next Saturday organised by West Row horse owner Trudy Lovatt, have been backed by the BHS and by Elizabeth Barrett, who has spent 30 years trying to establish new bridleways and protect existing ones. “This plan is appalling,” said Mrs Barrett, who is a BHS activist and leader of the Camino Riders bridleway route. “It will encourage the ‘head down, flat out’ cyclists and there are going to be accidents. Horses don’t hear them coming. Trudy Lovatt agrees and said she had been involved in an incident where one of her horses kicked a cyclist. She said she had warned him to keep back where it was too narrow for him to pass safely, but he kept on and frightened her horse. Cyclists can legally use the bridleway now, but Trudy and other riders are worried that a tarmac surface would allow them to go faster and more quietly. Another rider said she was worried that tarmac would not only encourage racing cyclists and those doing time trials, but also illegal motor bike and vehicle users. Village residents are supporting the campaign to keep the bridleway as it is. Bill Phillips, who lives next to the start at the West Row end, said that though the council called the plan an upgrade, it would destroy the bridleway’s character and attraction. “I take my grandson for walks down there and he loves it. Children need this chance – if they put tarmac down, you might as well walk down the road,” he said. County councillor Colin Noble said people had been asking for a cycleway between West Row village and Mildenhall for many years, so the county obtained a £150,000 government grant to make this possible. The NAF Shining Star Award for August 2013 has been given to 13 year-old Adele Rand from Herts a keen and talented member of the British Showjumping Essex Junior Academy. Adele is a helpful and determined member of her local Junior Academy and it is for these reasons that she has been awarded the NAF Shining Star Award. London 2012 Olympic team champion Ben Maher (GBR), who won team gold and individual silver at the P.S.I. FEI European Jumping Championships in Denmark last month, is the new world number one in the Longines Rankings, the FEI World Jumping Riders Rankings, for the first time in his career. This is a spectacular progress for the 30-year old British rider who, with 2,510 points, has advanced from 19th place to claim the top spot.